Profile: Ash joined the club in July 2015 from Hellenic League side and neighbours Highworth Town. 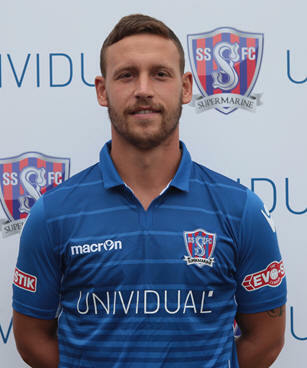 He is a powerful central defender with good qualities on the ball and makes the step up a division after helping Highworth reach the Semi-Final of the FA Vase in the 2014/15 season. He was the manager’s first choice central defender in 2015 and 2016 before two serious injuries saw him miss the best part of the 2017/18 season. Firstly, a troublesome foot injury led to an operation in October 2017 that kept him out of the squad until two substitute appearances in April. During the last substitute appearance at Kidlington he suffered another injury setback with a ruptured Achilles tendon that required immediate surgery and he is unlikely to be back in full training before November 2018.